It's Time For Baseball To Stop Wasting Fans' Time With baseball's new season set to begin Thursday, commentator Frank Deford says the game needs to break with a long-standing tradition: wasting time between pitches. Because love may be eternal, and a diamond is forever — but nine innings should last only around 2 1/2 hours. 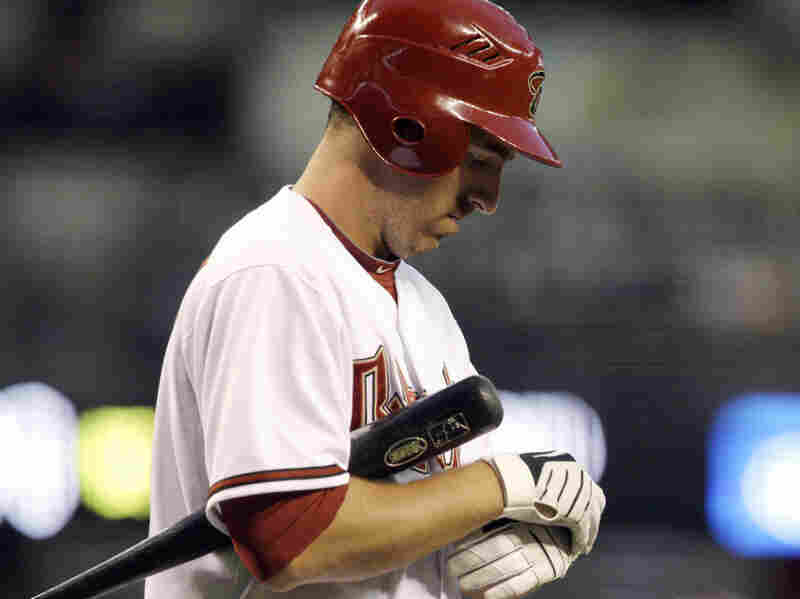 Blame The Gloves: Many baseball players, like the Arizona Diamondbacks' Adam LaRoche, fiddle with their batting gloves during each at-bat, stretching out their time at the plate. As a fan, there are always things I wish the various sports would do to improve themselves. For example, I wish more football coaches would go for it on fourth and short yardage; I wish NBA referees would stop giving breaks to superstars; I wish they'd get rid of the goons and the fighting in the NHL. But most of all, as we begin a new season, I just wish they wouldn't take so long between pitches in baseball games. Look, I know some folks like punts and field goals, and charity for superstars, and goons and fights. But have you ever heard one person — one human being — say, "Boy, I wish they'd take a little more time out there between pitches?" No, no one. Ever. In fact, baseball would move along just fine, if they'd only enforce a rule — No. 8.04 — that is already on the books, which says that when the bases are empty a pitcher has to deliver the old horsehide within 12 seconds after the batter gets into the box. We just need a clause added to that rule that the batter has to get into the box pronto and stop fiddling with his batting glove. The worst thing that ever happened to baseball was batting gloves — because unlike all the other gloves in the world, which people just put on and forget about, baseball batters seem to be born with a compulsion to monkey around with their batting gloves. Batting gloves, to baseball players, are like texting to teenagers. But baseball can never bring itself to correct itself. Meanwhile, in the midst of the current lockout, the NFL just went about its business and made a major rule change about kickoffs. Baseball and the United States Senate are the two institutions that give "tradition" a bad name. The main problem baseball has, besides indecisive leadership, is that it firmly believes that clocks are pornographic. It is the catechism that only baseball is pure, because it is timeless. Hey, baseball: Love may be eternal, and a diamond is forever — but nine innings is just about right for 2 1/2 hours. It's all the more important now to put a clock on the batter, and another one on the pitcher, because more and more relief pitchers are used in games, and that takes up additional time. And modern strategy encourages batters to take more pitches. Okay, maybe 12 seconds is too short. College baseball has a new rule that the pitcher absolutely must throw the ball within 20 seconds. Now, isn't that reasonable? Certainly, a batter can sufficiently caress his batting glove, and a pitcher can find the seams on the baseball, in 20 seconds. For goodness' sake, it's just the two of them. Twenty-two football players manage to jump all around, and get a play off in 30 seconds. Please, baseball. You're boring us. Time is of the essence. Success goes hand and glove with ... hands and gloves.